Most musicians self-sabotage their own music careers by living in a constant state of fear. Fear is the #1 thing that holds people back from starting and growing their music career. It's not about lack of musical talent, lack of music industry connections, lack of opportunities or lack of money. Your success also has very little to do with where you live (you can build a successful career virtually anywhere). That said: you cannot build a successful career by living in fear. Many musicians let their fears control what they do (or don’t do). Some fears are felt on a conscious level, while others are subconscious and are only obvious to the trained eye. Yet the results of fear are as predictable as they are ironic: the very things that you are afraid of end up ruining your career. As a music career mentor to hundreds of musicians, I have seen this scenario play out countless times. Although the above statements are generally told to you with good intentions, they could not be further from the truth (I explain why this is so in great detail in my other music industry articles). Fact is, it’s really “not that hard” to make a VERY good living in the music business if you know exactly what to do to earn money as a musician (and actually DO it). That being said, it’s precisely because the above myths about the music industry are so common, that they condition many musicians to be afraid of (and actually EXPECT) financial struggle in their careers. As a result, this fear leads most to start taking actions that are exactly OPPOSITE to the steps you NEED to take to ensure financial security in this industry. You never even try to earn more money in your music career. The absolute worst thing you can do is simply settle for and expect financial struggle as a musician. It’s obvious that when you do this, your fear becomes a self-fulfilling prophecy. You run full-speed ahead away from your music career. By expecting financial failure and struggle, many musicians falsely think that they will be better off first getting a college degree in an unrelated field, getting a “safe and secure” job and THEN pursuing their music career on the side. Learn why this leads to failure virtually 100% of the time in this article about music career backup plans. You eat the goose that lays golden eggs. Note: What I will write below may seem entirely as “self-promotion”, as I will be talking about my music career mentoring programs to illustrate a very important point. Fact is, there is a hugely important lesson for you here, and my words would be 100% true regardless of whether or not I had something to sell. The lesson for you here illustrates how the very fear of going broke often ENSURES that you STAY broke as a musician, until you do something about it. I sometimes hear from musicians who hesitate to join my Music Careers Mentoring Program or attend my Music Career Money Magnet live event (where I show musicians how EASY it is to make HUGE amounts of money in music), because they think “they can’t afford it”.Even when I show them the overwhelming proof of how all my programs have literally transformed the lives of musicians I’ve mentored, they are STILL skeptical and full of fear. This skepticism is rooted in the same mindset I described above - that it’s useless to even “try” to become successful financially, since musicians are “destined” to be broke and struggle. Ironically, by trying to “save” a few dollars in the short term and bypassing the training (that is PROVEN to work) on how to build a lucrative music career, you are ensuring that you will never make good money in music. This is called “eating the goose that lays golden eggs” because you are too hungry now to wait for the eggs to appear. :) Instead of investing into your future and learning how to make your career financially successful, giving in to your fear ensures that you stay exactly where you are - continuing to struggle financially. 1. Realize that the belief that all musicians are destined to struggle financially is false and it does NOT have to be this way for you. This realization alone will empower you to move towards what you WANT in your career, instead of what you “fear”. 2. Instead of worrying about how to “not struggle financially”, commit to learning how to BECOME financially successful as a musician. There is a VAST (and fundamental) difference between these two mindsets and the results that each one leads to are polar opposites. If they fail, they will look stupid in front of everyone who “warned” them about the possibility of failure and only prove their naysayers right. Your beliefs BECOME your reality. If you believe that you have some valid “reason” (read: “excuse”) for why you cannot become successful as a musician (such as any of the things above), it becomes so easy to rationalize why things do not go your way and blame external factors for why you haven’t yet taken action to become successful. When you do this, you are GUARANTEED to fail in the music business. The reverse is also true: if you believe that you WILL become successful no matter what, and that you are in control of your life and destiny, you are going to find a way to do what needs to be done to reach your goals. It should be obvious that the latter mindset has an exponentially higher rate of success (both in music business and in life). If you don’t even try to build a successful music career - you have already failed…by default. Even worse than the guaranteed 100% failure rate, you are going to live your life wondering “what could have been” when you look back at all the opportunities you missed to follow your dreams to have the music career you want. Think it’s impossible to be “afraid of success”? Think again. While the above fear of “failure” is common to less-experienced musicians who are just entering the music business, fear of “success” is common to more experienced musicians who are just on the brink of a huge breakthrough in their music careers. These musicians can sabotage themselves by worrying about how their lives will change as they become successful pros in music, what other people will think of them, how hard it will be to maintain their success or thinking subconsciously that they do not “deserve” success. As a result (as crazy as this sounds), many musicians begin to intentionally do things that they themselves know are against their own best interest (such as turning down opportunities to join bands, go on tour or get the training that they know they need that will lead them to success). 1. Realize that all the stories you tell yourself about why you can’t have a music career in your situation are just that…stories. You have infinitely more potential for success as a musician than you realize, no matter how old you are, what your musical background is or where you live. Read my other music career articles to learn the steps for building a music career. 2. Think like successful musicians think. As explained above, there is a fundamental difference between “playing to WIN” (in one’s music career) vs. playing “not to lose”. Successful musicians do the former and they do not base their music career strategies on “avoiding fear” - they focus on “achieving success”…and so should you. 3. Stack the deck of cards in your favor. You will maximize your odds of success in the music industry (and overcome your fear of failure), if you don't navigate the music business blindfolded. 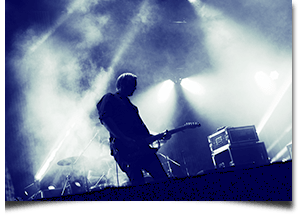 Instead, speed up your progress by getting guidance from an expert music career mentor who has already helped hundreds of musicians build successful music careers. The music industry is full of stories of failed musicians who claim that someone in the music business has forced them to sign an unfair contract, refused to pay them more money or in one way or another “screwed” them - causing their careers to fail. Stories like this make many musicians fearful of entering any business deals in the music industry and often prevent them from pursuing a music career entirely. It’s not the “musicians” who should be afraid of being taken advantage of by companies in this business - it’s the COMPANIES who should be (and are) afraid of being “screwed” by the MUSICIANS they work with. Contrary to popular belief, most music industry companies are NOT out there to rip off musicians. Instead, they are HUNGRY for new talent, for win-win partnerships and for ways to leverage their resources (with the help of musicians they work with) to grow everyone’s career in a mutually beneficial way. …and a huge list of other factors (take this test to learn what the music industry wants from you). Fact is, music companies put up HUGE amounts of time, money and other resources at stake every time they work with new musicians. They have a lot more to lose in an unprofitable business venture than most of the musicians they work with do, so it’s natural that they are carefully selective of the musicians they work with. It’s just as natural that they refuse to act against their own best interest and work with musicians who they consider to be risky investments or give them more money than they have earned or are entitled to. Learn EXACTLY what music industry companies want from you (this goes FAR beyond your musical skills). Acquire the pieces of value you need to have to make yourself the #1 choice for the best music career opportunities. Communicate your value to the companies you want to work with by building a rock-solid reputation for yourself as the musician who adds value with minimum risk. When you do this, music companies will fall over themselves to work with you on opportunities that other musicians will only dream about (and will compensate you handsomely for the exceptional value you provide). Now that you know what fears hold so many musicians back from starting and growing their music careers, take mental inventory of your thoughts and beliefs regarding working in the music business. As you become aware of the fears that have been holding YOU back, take action to change your mindset (using the resources and tools discussed in this article). When you do this, you will see your fears melt away as your music career begins to take off exponentially. To get on the fastest path to success in your music career, read this page right now about music career training. Build a highly successful music career by training with a music career mentor.